What better way to say I love you than to wake up with your loved one with the sounds of the ocean?! 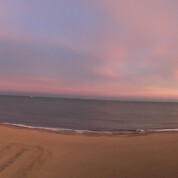 The sun kisses the horizon and the pink and orange rays bounce off the clouds- yes this is what Virginia Beach is all about! Virginia Beach has always evoked this inner sense of well being- soul warming love for so many. You hear time and time again from lovers, adventurers, mothers, fathers, children, travelers and locals about this sense of ‘being’ which erupts from within when in Virginia Beach. There’s this crazy sense of vulnerability, not helplessness but, in fact this sense of vulnerability is empowering, enlightening and rare in a world full of deadlines, stress and pressures. Virginia Beach has this vibe that seemingly no one escapes, a vibe where you lose traction, an energy when you can simply lose track of time.